Eleven-year-old Pooja adds up five digit numbers with amazing speed and accuracy. So do her siblings, Kinjal – just nine years and Kartik – all of four years. They all have a liking for numbers and have been exposed to the magic of numbers at a very early age. Kartik adds and even multiplies two digit numbers when children his age are just learning to write 123…. Advantage is in being children of Divesh Shah. The foundations for calculations and mental mathematics have been laid early for them. For them, numbers are like puzzles. Tackling numbers gives them a sense of achievement. A fact which can be seen on their faces, when they present their skills in front of packed auditoriums. So the key word is ‘foundation’ and that too a strong one. Good buildings are built on strong foundations. And deeper you go along with good quality material, you do get a stronger building. Same principle applies in life too. Early years of a child are of utmost importance. Building love and interest for the subject in the tender minds of children could make them comfortable with numbers and remove the fear associated with it from their minds. Keeping this is mind and trying to do it more practically, Shah has trained his children to play with numbers. The children in turn have kept up his expectations and proved that nothing is impossible or difficult. And the result is a heart stealing performance and huge applause from the audience. Shah would most certainly like to train young minds to be comfortable with numbers, which would help them tackle 5-digit by 5-digit multiplications within split seconds. The idea behind these shows is to convey to all the students that regular practice and determination can make them confident as well as accurate. 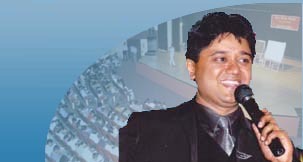 The feedback received from many students after the show is of stories of how Shah’s techniques have motivated and encouraged them to do better.